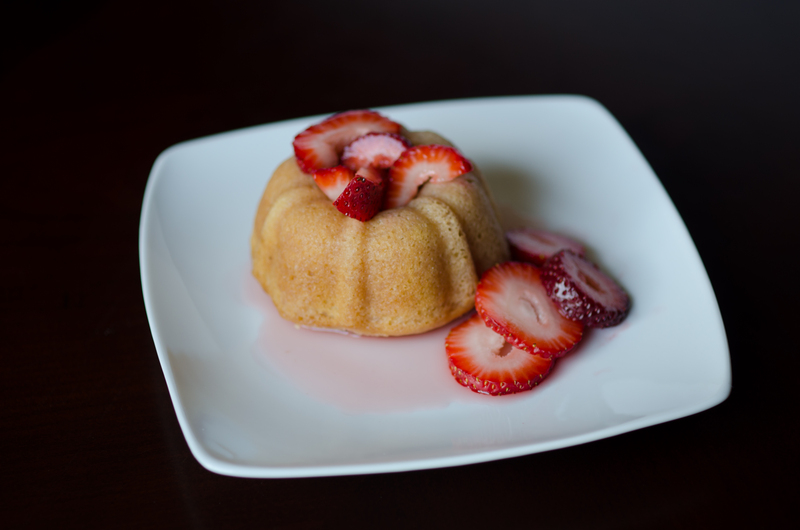 The recipe for the bundt cake is from The Millenium Cookbook. I made this for Mother’s Day and everyone loved it. However, the strawberry sauce I used that time called for putting strawberries in a blender with some water and sugar and blending. The sauce came out the same shade as pepto-bismol. I hate pepto-bismol. Bad memories from childhood have permanently scarred me from using, wearing, buying or eating anything that shade of pink. So, no offense to the sauce, but I decided to make something simple on my own. This time I made a strawberry flavored simple syrup. Bring the water to boil in a small saucepan over medium high heat. When it boils, add the strawberries and let it boil for another minute or two. Add the sugar and stir till combined. Lower the heat to medium and let simmer for another 3 minutes. If you want a thick syrup, let it boil for about 7-9 minutes and it will thicken. Pour the syrup through a fine mesh sieve and into a bowl. You should now have a clear syrup with a pink tint. I sliced fresh strawberries and placed them on the cakes. Then I poured 2 tablespoons of the simple syrup over the strawberries and cakes. These were perfect for me.